It’s time to celebrate the wonderful work of St Agnes’ EYFS and Key Stage One children again. Safiyah has had a fantastic week last week! She has been really focusing on her writing and the Nursery Team are very impressed with her efforts. Kaif has been extremely expressive too. He has been showing other children how to behave both inside and outside the classroom. The Nursery Team are extremely proud of his achievements. It was no surprise that the staff gave every child in Reception Circles a special recognition award for their amazing work on Friday. The children’s performance of the ‘Supertato’ story in their Assembly was simply OUTSTANDING!! It was an ‘INSPIRATIONAL’ start to the week today for Reception Triangles. All children participated in Aspiration Day. Looking at dream careers, dressing as their dream job and asking lots of fabulous questions to ask the visitors who shared their work life experience with them. Miss Farrar and Mrs Choudhury thought of all of Reception Triangles deserved special recognition for this! Faizan had been extremely impressive when partitioning 2 digit numbers too. Mrs Smith and Ms Hewatt were bowled over with his confidence! Minahil and Mohammed Hussnain were given special recognition for their fantastic work across the week. Mrs Cadwallader is extremely proud of both children. Aaghar has been making excellent progress in her reading and writing! Ms Oxley is extremely proud of her achievement in Literacy. Zahra has being impressing Ms Oxley with her super writing as she has been using lots of Stage 2 features confidently. Well done, Zahra! Ibrahim impressed Mrs Barker last week as he was trying hard to write using Stage 2 features of writing! Super work, Ibrahim! Akiah also produced a super writing piece using all Stage 2 features with confidence. Well done, Akiah! Mrs Barker thinks you’re amazing!! YEAR ONE CIRCLES ARE TO BE CELEBATED AS THEY ARE CLASS THAT HAS BROUGHT IN THE MOST SPARE CASH FOR OUR PLAYGROUND FUND! Lots of the children across the school have brought in pocket money, tooth fairy money and loose change too! 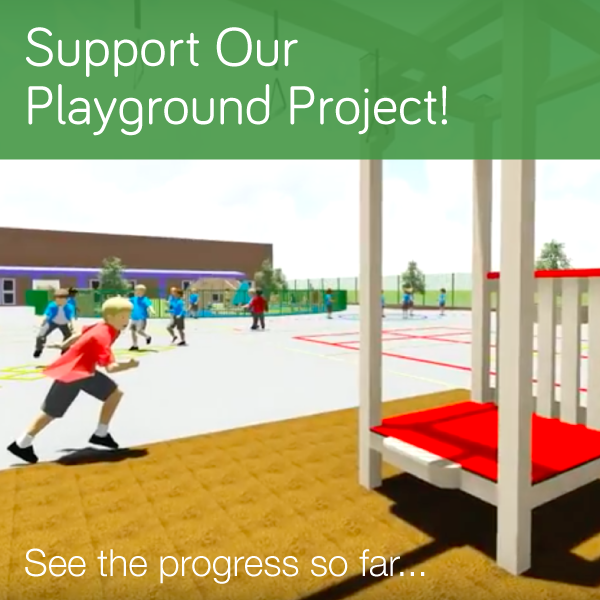 Lets keep this going guys our dream playground will soon be a reality if we do.